After your home, your car is probably your most important investment. It takes you wherever you want and brings you back home. After Year-Round use, some wear and tear will show if you don’t regularly care for and maintain it. Whether it’s cleaning, waxing or making repairs and maintenance, exterior car care should become a regular part of your car care routine. Take some time to review the following car care tips to keep your vehicle running at its optimum condition. One of the best car care tips you can receive is to keep your cars exterior clean. Washing your car often can remove harmful debris and reduce the chance of your car rusting. Choose a shady spot in which to work. It’s usually best to wash your car in the morning or evening when the sun isn't as intense, but if you have a spot in the shade to do the job, it doesn’t matter what time of day you start. Let the car exterior cool down if it has been in the sun for an extended period of time. Fill a bucket with a couple capfuls of concentrated car cleaning solution and water (check manufacturer's directions for exact amount of cleaner to use). Wet down the entire surface of the car using a garden hose with a spray nozzle. Dip a sponge or washing mitt into the bucket and start on the roof of the car. Wheels and tires should be cleaned last. 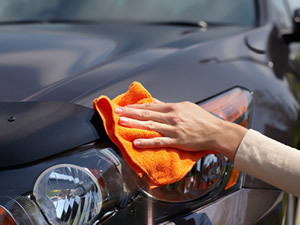 Since they make contact with the road and collect the most oil, dirt and grime, it makes more sense to clean the rest of the car first so you don't transfer dirt from them to the rest of the car. Grit from the tires and lower panels of the car can also stick to your sponge and then scratch your car's paint elsewhere. Wet the wheels with your hose and then spray a wheel and tire cleaner onto them. Let the solution sit for a minute or two and then wash them with the washing mitt and soap. Rinse them off. Scrub tires with wheel and tire cleaner and a stiff brush. Only clean the rubber though; be careful that you don't use the brush on your rims as the brush might scratch them. Use a bug and tar remover to remove caked on bugs and any tree sap or road tar that may have collected on the car's finish. Simply apply a bit of cleaner to a soft rag and wipe debris away. Stubborn debris may require a couple of applications. Rinse the cleaned area with your hose. WD-40® is a good home remedy for removing caked-on bugs and debris if used sparingly. It should only be used on small, tough-to-clean areas. Simply spray it on the desired area, let it sit for 30 seconds and then wipe it and the offending debris away with a rag. Dry the car using soft, clean towels that you keep specifically for drying your car, or better yet, use microfiber drying towels or chamois. Chamois, commonly known as shammies are leather cloths, designed to soak up water better than a regular towel and help prevent water spots. After the vehicle has dried, pour (or spray) a dab of vinyl and rubber protectant onto a clean rag and wipe it on all vinyl, plastic or rubber parts on the vehicle exterior. These will most likely include door and window moldings, trim, rearview mirrors, and tires. Wipe with a circular motion for complete and even coverage. Wait for the protectant to be absorbed. Once it is absorbed, the surface will look and feel dry. Then with a new, clean rag, wipe down the parts. Waxing your car protects the paint and finish. In essence, it seals the exterior and protects it from the elements, UV rays, salt, splattered insects and bird droppings, while it leaves the car looking shiny and new. Wax usually comes as a paste, liquid or cream. There is endless debate about which brand or type of wax to use, but most car enthusiasts prefer a carnauba-based wax in any form. One application of this wax usually lasts about six to eight weeks. Before applying, either dip an applicator pad into the wax container (for pastes and creams) or pour a small amount onto the pad (liquid). Many waxes are sold with applicator pads, but they can also be purchased separately. •	Phone your insurance agent or a local company representative. Do it as soon as possible even if you're far from home and even if someone else caused the accident. Ask your agent how to proceed and what forms or documents will be needed to support your claim. Your company may require a "proof of loss" form, as well as documents relating to your claim, such as medical and auto repair bills and a copy of the police report. •	Insurance consumers make their own choice when selecting an auto body repair shop to fix their car. Many states have laws that prohibit steering to specific repair shops. 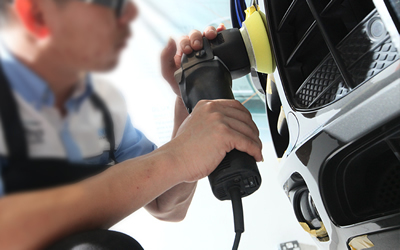 •	Make sure you hire an auto body shop that provides guarantees and specific timelines on repairs. Your insurance policy has certain limits and deductibles, so find out settlement amounts before you sign off on repair costs. If you don't know where to take your vehicle to be fixed, most insurance companies will provide you with a list of repair shops that are backed by repair and labor guarantees. •	Supply the information your insurer needs. Cooperate with your insurance company in its investigation, settlement or defense of any claim, and turn over to the company immediately copies of any legal papers you receive in connection with your loss. Your insurer will represent you if a claim is brought against you and defend you if you are sued as the result of an accident. •	Keep records of your expenses. Expenses you incur as a result of an automobile accident may be reimbursed under your policy. Remember, for example, that your no-fault insurer usually will pay your medical and hospital expenses, and possibly such other costs as lost wages and at least part of your costs if you have to hire a temporary housekeeper. •	Keep copies of your paper work. Store copies of all paper work in your own files. You may need to refer to it later. •	Talk things over with your agent or an adjuster if you are dissatisfied with the settlement offer. Check your policy to see what settlement steps it outlines. •	Move any injured persons. •	Apologize for the crash. •	Tell any party how much insurance you carry. •	Accept any money. If you do, you forfeit your right to file a claim. •	Agree to forget about the accident. Later on, the other person may file a lawsuit against you. •	Am I covered for these losses? •	What is my deductible? •	How long will it take to process my claim? •	Does my policy have a time limit on filing a claim? •	Is there a time limit during which claims must be resolved after they are filed? •	What are those time limits? So, I've filed my claim. How is it processed? First of all, the insurance company must confirm that your policy is in effect and that the accident is covered. After that is determined, your claim may be assigned to a claims adjuster. The adjuster will look at the damages to your car, evaluate the loss and figure out how much you can claim under your policy. This figure will be the insurance company's estimate of what they will pay to repair your car—the total claim payment. You can often save money by going to a mechanic recommended by your insurance company or using generic auto parts for repairs. However, if you feel uncomfortable with their recommendations, remember that it's your option to get an estimate from another mechanic. In fact insurance companies can't make you go to just one place for repairs, but they can ask that you get more than one estimate to make sure that they don't pay an inflated repair bill. Q. What if I'm sued for more than my policy limit? A. Your insurance company will defend you if you are sued, however they may recommend that you get a lawyer. Why? Remember that your insurance company is only at risk for its policy limit. You are responsible for any remaining amount. For example, if you are sued for $1 million and your policy limit is only $300,000, you are responsible for $700,000. Q. What if I am a passenger involved in an accident? A. Like the driver, collect all important information—names, addresses, license numbers, policy numbers, etc. How much you will collect for damages depends on how well insured the other drivers are. As a passenger, you can collect for damages from one of two ways: 1) under your driver's medical payments coverage or 2) filing a claim against the at-fault driver's liability coverage. Q. Can I accept a cash advance to have repair done on my car without forfeiting my right for additional money for repairs? A. Yes, unless you sign an agreement that releases the insurance company from paying you additional money. Q. What if my car is declared a total loss? A. If your car is declared a total loss, your insurance company will pay you for its value by using references such as the "blue book" and/or by consulting car dealers. Be aware that the specific condition of your vehicle, including mileage or the tires, influences how much your vehicle is worth. If you feel you deserve more, consult your agent or company. Q. What if I don't report an accident to my insurance company? A. You should report all accidents even if you don't end up filing a claim. If you don't report it, you run the risk of being sued by the other persons involved in the accident and your insurance company will be at a disadvantage in defending you. Q. What if I loan my car to a friend who causes an accident, is he or she covered? A. Under most circumstances, someone using your car with your permission is covered by your insurance. In most cases, your insurance will treat it just as if you were the driver. Q. Will my rates go up or will I lose my insurance if I get into an accident or get a ticket? A. If you are not at fault in the crash, your insurance is usually not affected. If you are at fault, get a ticket for a serious violation (i.e. drunk driving) or are involved in a costly property damage claim (i.e. crash into a tree), your rates may increase at the time of policy renewal because you will be categorized into a higher risk group of people. The same rule generally applies if you get three traffic tickets within three to five years.